Home > Entranceexam > Institute Of Agri Business Management (IABM) MBA Admission 2018 - Registration Started! IABM Bikaner offers PGDM in Agri-Business Management. It is 2 years fully residential programme. The students who have completed their graduation from any institute in India recognised by ICAR are eligible for admission. The batch 2018-20 is the 19th batch of IABM Bikaner. Institute of Agri Business Management (IABM) MBA Admission 2018 will be based on marks scored in CAT 2017 / MAT 2017 / CMAT scores and GDPI at IABM. IABM application for two-year full-time residential MBA Programme for the academic year 2018-20 has started and the last date to fill the application form is 31 January 2018. MBA (Agri-Business) from IABM helps the student to groom their skills into professional managers for core areas of agri-business and allied sectors. MBA (Agri Business) aims to provide an inclusive coverage incorporating the foundation and elective courses relevant to management discipline, in general, and agribusiness management in particular. The candidates willing to take MBA (Agri Business) in IABM needs to appear in CAT/ MAT/ CMAT 2017 and need to fill an online application form of Institute of Agri-Business Management. IABM MBA Application Begins - Registration Started! Nationality: The candidates must be an Indian National. Age: The candidate must be below 30 years of age. Academic qualification: The candidate must have completed their Bachelor’s Degree in Agriculture / BBA (Agriculture Business) or Allied fields (Horticulture/ Vet. & Animal Science / Dairy Science / Dairy Technology / Food Science/Food Technology/Agricultural engineering/Agro-Forestry/Home Science/Fisheries, etc.) from any Agricultural University or Institution recognized by ICAR . The candidates must have minimum 60% marks (55% in case of SC/ ST). Final Year Graduating students expecting to complete all Degree requirements by July 2018 are eligible. The candidates must have qualified any of the National Level examination that is CAT/ MAT/ CMAT 2017. In service candidates: There is a relaxation of upper age for the in-service candidates and there are five seats reserved for these candidates. Foreign Nationals: The Foreign students may only be considered for admission on the basis of nomination from ICAR/Govt. of India on two Supernumerary seats. The application process for the IABM MBA has started and the candidates can fill the application form through online mode. However, the payment of the application form can be made online as well as offline. Before filling up the application form, the candidates are suggested to ensure their eligibility. The link to apply online for IABM MBA is given below. The last date to fill the IABM MBA Application Form is 31 January 2018. The application form is to be filled on or before the deadline. The candidates must fill the IABM Application Form by filling all the Mandatory details of their personal and academic qualification. The Aadhar card number and PAN card number of the students have to be given while filling the application form. The candidates belonging to Rajasthan have to attach their Domicile Certificate as proof. Online payment: The candidates can pay the application fee using the Online Payment Gateway that is Net Banking/ Credit/ Debit Card. Demand Draft: The candidates must pay the application fee of through Demand Draft of Rs.1000 in favour of “ Director, IABM, SKRAU, Bikaner”, payable at any Nationalized Bank in Bikaner. The candidates before submitting the application form should ensure that the details filled by them are correct in all aspect. The application form would be submitted through online mode only. However, the candidates can make the payment of the application form through online as well as offline mode. Application Fee: The application fee for IABM MBA (AB) is Rs.1000. The candidates can make the payment of the application fee either through Net Banking/ Credit/ Debit Card or through Demand Draft. The fee has to be paid on the first day of the registration and it has to be paid via demand draft in favour of The Director, IABM, SKRAU, Bikaner. Institute of Agri Business Management (IABM) MBA Admission 2018 will be done on the basis of the scores of CAT/ MAT/ CMAT 2017 followed by Group Discussion and Personal Interview. Candidates shortlisted on the basis of the qualifying scores are considered for admission as per the eligibility criteria set up by the Institute. 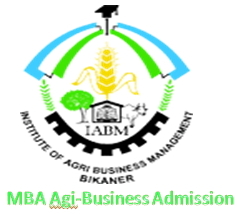 The candidates selected for Admission to MBA Agri Programme in Institute of Agri Business Management (IABM) are required to produce medical, and physical certificate at the time of admission. It is known that the IABM MBA Admissions will be done on the basis of CAT/ MAT/ CMAT 2017 scores. Hence, the candidates are advised to go through the exam pattern for the qualifying exam they are appearing in. MAT 2017 - Management Aptitude Test is conducted by AIMA for admission in MBA colleges in India. It is conducted four times in a year. The candidates appearing on the MAT Exam should follow the MAT Syllabus & Exam Pattern. CMAT 2017 - Common Management Entrance Test is a national level management admission test administered by AICTE for admission into MBA colleges. Get the CMAT Exam Pattern to prepare well. 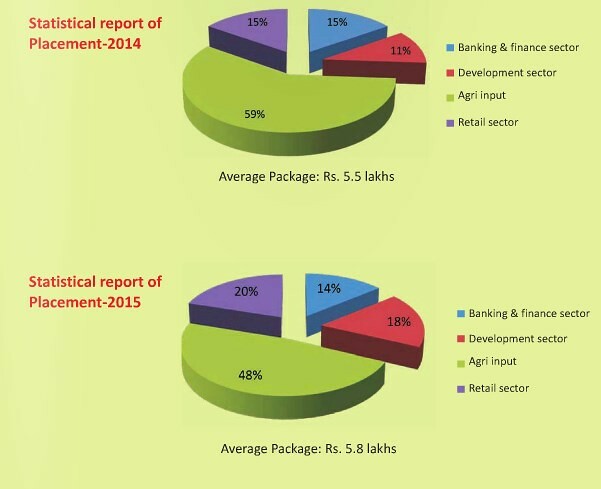 In addition to MBA (Agri), IABM, Bikaner also offers Post Graduate Diploma in Agri Input Management (PGDAIM) course. OBC, SC, ST, PH, female candidates and Kashmiri migrants seats are reserved as per the reservation policy of the Government of Rajasthan, implemented by the University. Candidates claiming reservation shall be required to submit appropriate certificate at the time of Group Discussion/Personal Interview, failing which they shall be treated in general category. Any subsequent claim for reservation shall not be entertained. A maximum of 10 seats (40% of the intake capacity), distributed among different categories, are meant for the candidates from other states, provided they find a place in the merit list. In case a seat remains vacant for any reason, the same may be filled by a candidate belonging to Rajasthan State or vice-versa. Institute of Agri Business Management Placement Cell provides 100% Placement to the students in MBA Agri Business Programme. IABM has been providing suitable Placement to its students in various organisations primarily in the Corporate Sector. IABM mostly attracts those best organisations covering the important areas of Management such as sales & marketing, operations, General management, consultancy, banking, commodity exchanges, human resources, etc. IABM is also opening Placement opportunities for its students in the Agri-Business sub-sectors such as retail management, agri-inputs, commodity exchanges, supply chain management, microfinance, rural marketing, food processing, consultancy, agricultural trade etc.